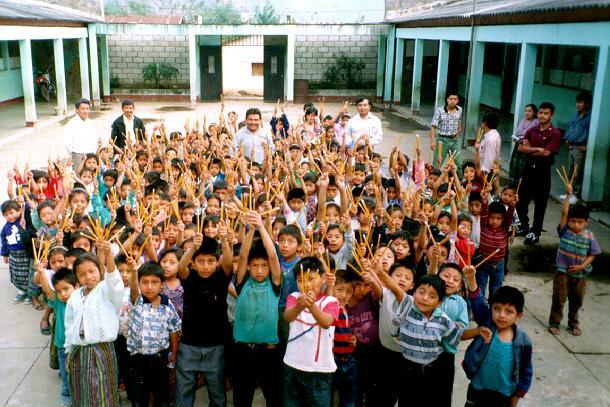 When Pedro Rafael Gonzalez Chavajay visited United States in February of 1998 his purpose was two-fold: to promote his art; and to get pencils for the children in the public school in San Juan la Laguna where he has been a bi-lingual teacher for over fifteen years. 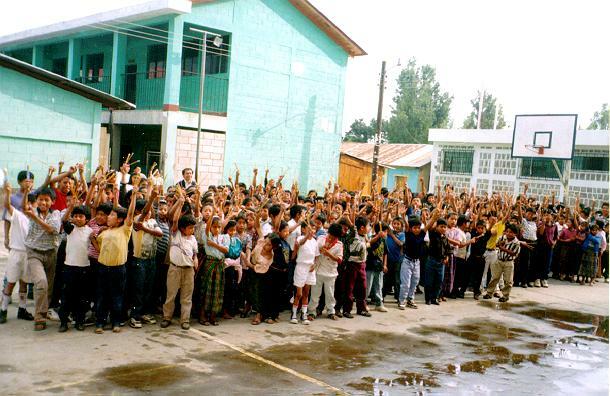 In Guatemala the government provides salaries for the teachers and not much else. The town must provide the school building. Any books, notebooks and writing supplies must be provided by the town and the parents. If a family afford it they will send their child to a private school supported by one of the churches. Each child in these schools has a sponsor, usually someone in the United States, who sends the school money each month to help with the childs education. The children from the poorer families can not pay the nominal monthly tuitionabout four to six dollars a monthand so they must send their children to the public schools. Often a child in the public school will be absent for a period of time. When the childs return, the teacher will often find out that the reason for the childs absence was that he or she didnt have a pencil, and was ashamed to come to class. Pedro Rafael raised money for the school children at his receptions in Berkeley, CA and Phoenix, AZ. 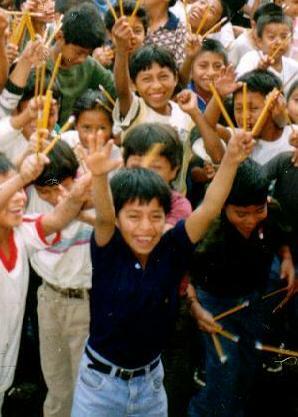 There was enough money to but each of the 800 children in his school three pencils each, and because the assistant manager at Office Max in San Francisco, where the prices of pencils were by far the lowest, reduced the price further, Pedro Rafael was also able to buy a rugged pencil sharpener for the school. 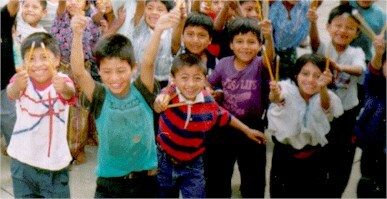 The principal of the school, sent Arte Maya six photographs of the children with their new pencils. 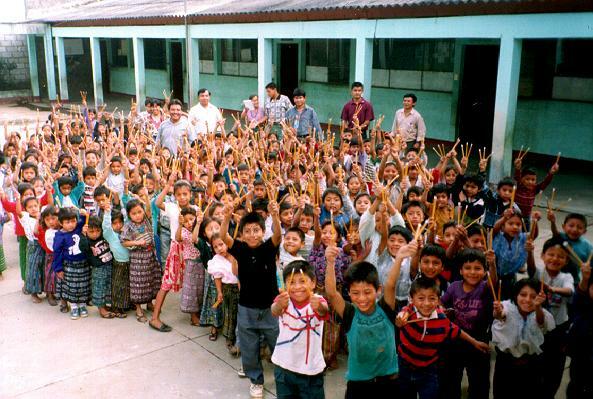 The photographs say a great deal about the difference between schools in the United States and Guatemala. 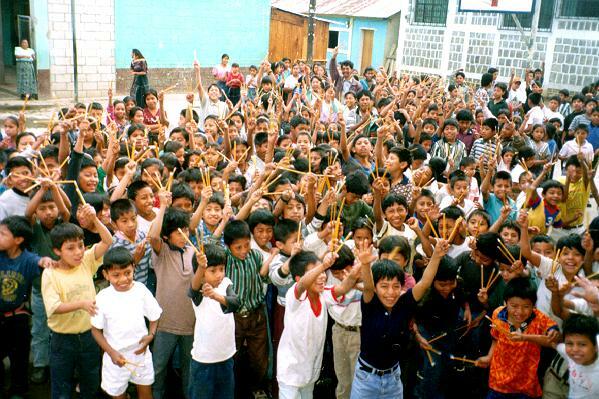 When given a gift of three pencils for each student, what school in the United States would bring all the children into the school yard to be photographed with their pencils? What grade school students in the United States would be thrilled to be photographed with their new pencils? These photographs are truely worth a thousand words.